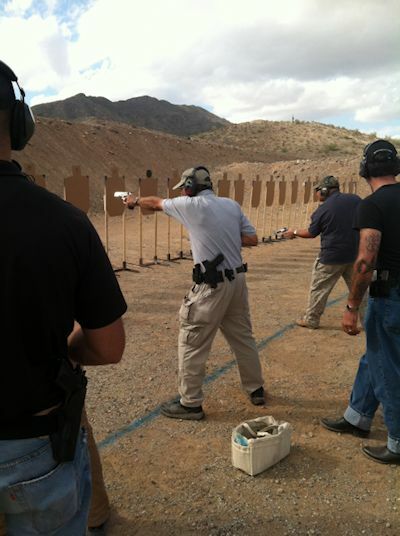 If I had to summarize the Massad Ayoob Group MAG-40 class in one sentence, it would be this: “You spend 16 hours on the gun range learning techniques that would allow us to use lethal force to kill or disable threats, and 24 hours in the classroom learning why you want to avoid that outcome at all costs.” As I wrote in an earlier blog, Ayoob’s view is that there are no winners in gunfights; the only victory is deterrence. In any event, at the end of the 5 day course, students take a 25 question, multiple choice exam on the material learned in the classroom. These exams are kept by the Massad Ayoob Group and can be used as evidence in court to show that the student had a basic understanding of the principles and laws that govern the justifiable use of lethal force. For 60 rounds, a score of 300 is perfect. 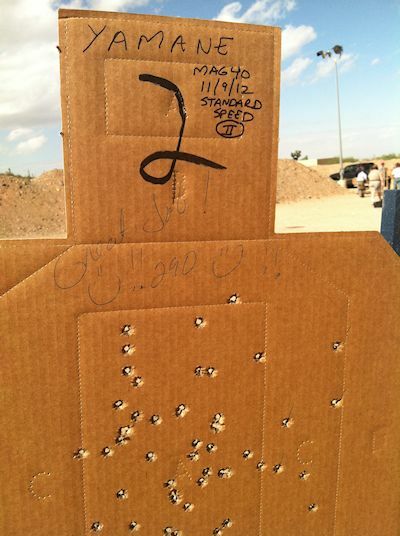 Targets are standard IPSC brown cardboard. Shots in the middle “A” zone (6″ wide by 11″ tall) score 5 points, “B” and “C” zone are “1 down” or 4 points. “D” zone are 2 down or 3 points. Missed or unfired shots score zero. One interesting aspect of the qualification is that the range officers/instructors all shot the course first as a pacesetter. Massad Ayoob shot a Smith & Wesson revolver (as did Phil Wong, to his right in the picture below), scoring a perfect 300 with a 4 inch group. That was the benchmark for us. Ayoob offered to sign a $1 bill for anyone who tied his score, and a $5 bill for anyone who beat it (in this case, with a smaller group). We were advised simply to focus on every shot – not on the goal, but on the task at hand. 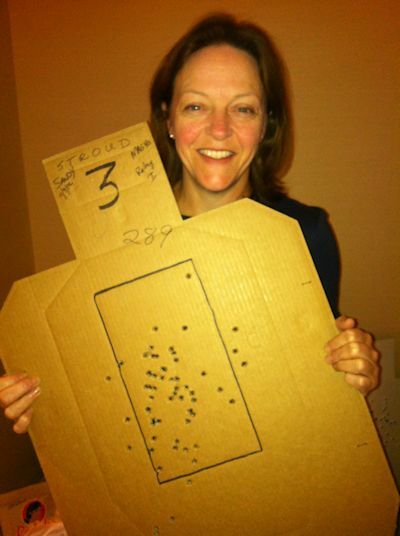 I was nervous, and like alot of other shooters pulled my first shot (the one-hand, off-hand from 4 yards). But after the first string I relaxed a bit and realized I could do what I had been training to do. Here I am shooting in the high-kneel position from the 10 yard line. 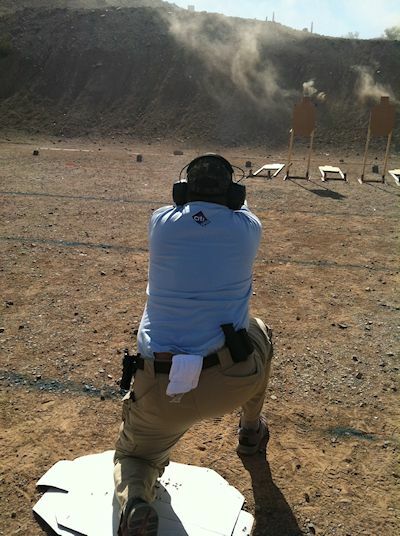 As part of the course, we learned Ayoob’s “Stressfire” shooting technique. One of the ideas promoted is the “crush grip.” Basically, this entails holding the grip as tight as possible in both hands. (Previously I wrote about champion shooter Rob Leatham visiting our class, and his affirming this technique.) Although it took some time to get used to, I found the crush grip was very helpful in terms of accuracy and speed. In the photo below you can see one of the recently ejected 9mm casings in the air still and I am already back on target with the Glock 17. In the end, I put 50 of 60 shots in the “A” zone, and 10 shots “one down” in the “C” zone for a total score of 290 out of 300. I was excited that this score put me in the top 5 of the class class of 21 students. 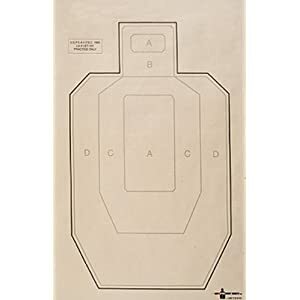 As you can see from my target, I didn’t shoot anywhere near Ayoob’s 4 inch group, but got most of my hits center of mass from a variety of different distances, using a variety of different techniques (most of which I had never used until that week). Ayoob did not have to sign any bills for students in our course (though he did autograph a few books, including one for me – The Gun Digest Book of Concealed Carry, 2nd edition). The high score in our course was Bruce, who used a Taurus (!) to shoot 297. He was followed by Mike (296), Robert and Phil (294), Dirk (291), and me (290). The average score of the class was just over 282. Interestingly, we divided into two relays, one with 10 people and one with 11. The average score of Relay I was 282.1 and the average score of Relay II was 282.7. A narrow margin of victory. Last, but not least, shout out to my friend Sandy who was the high lady and in the top 3rd of the class with a 289! 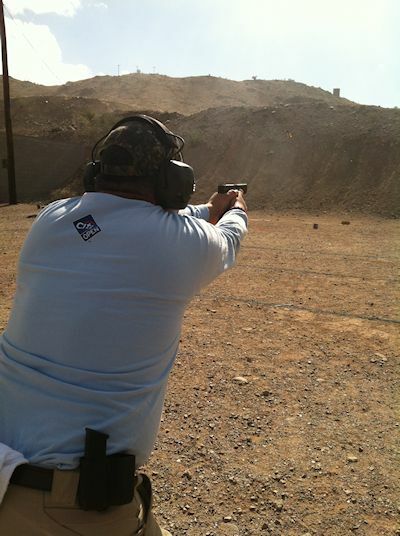 Tags: Glock, Handguns, Massad Ayoob, Smith & Wesson, Training. Bookmark the permalink. This course of fire was submitted to and accepted by NH Police Standards and Training for off duty shooting course of fire for Police officers in Weare, NH. I just completed this course earlier today, and the format for, us at least, was 4 10-four days. Very good description of what goes on in his class, I’ve been reading his work for almost 2 decades, and was determined to learn even more in this class–I got well more than I paid for.